SEAHEC hosts a variety of service learning opportunities for health professions students to focus on rural, border, and tribal communities with an emphasis on addressing health disparities. We host several groups of interprofessional health students annually. Our staff help develop learning activities by providing support for logistics and providing community context and connections to local health providers and community partners. An adjunct member of the UA Faculty, SEAHEC’s Executive Director Gail Emrick MPH is an International Health and Development Specialist with a joint Master’s Degree in Public Health and International Affairs from Columbia University, with a concentration in Latin American Economic and Political Development. She has won recognition from colleagues on both sides of the border for her leadership in building community partnerships to improve health care in southeast Arizona. SEAHEC partners with the University of Arizona College of Medicine’s Office of Diversity and Inclusion (ODI) to provide training and research opportunities to help prepare future health professionals to address health disparities in their practice. Border Latino and American Indian Summer Exposure to Research (BLAISER ) was created to address health disparities in Arizona’s ethnically diverse and fast-growing communities. BLAISER was created to address health disparities in Arizona’s ethnically diverse and fast-growing communities. This program is offered to students at no cost and they receive a $3,000 stipend, housing, and undergraduate credit for their work. Focusing Research on the Border Area (FRONTERA ) students who participate in the nine week FRONTERA program. A research internship offered to undergraduate, graduate and medical students at the University of Arizona, the FRONTERA Program is an ongoing services learning offering sponsored by the UA College of Medicine’s Office of Diversity and Inclusion (ODI). 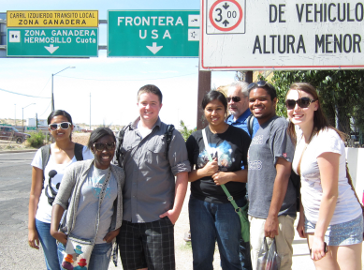 The program’s goals are to promote health services research in border communities while “increasing the pool of under-represented researchers interested in examining health disparities in the border region.” Students participating in the FRONTERA program can expect to gain hands-on research training assisted by one-on one mentoring and reflection. Icahn School of Medicine at Mt. Sinai University For nearly a decade, SEAHEC has worked with Medical Students Making Impacts, (MSMI) a student group from the Icahn School of Medicine at Mt. Sinai University in New York, who devote their spring break each year to providing needed health services in our community while learning about rural health care. Read about their most recent visit here. For information about SEAHEC’s service learning opportunities, please contact Erin Sol, esol@seahec.org, Coordinator for Student Training Opportunities.